Family Room overlooking Horseshoe Lake. Nice & Spacious. Great for your famiy getaway. Lofted family room adjoins to the dining area that seats 6 plus bar seating for 2 more! Opens to the Kitchen. Open Floor Plan - Kitchen, Dining & Family Room. Great for Families. 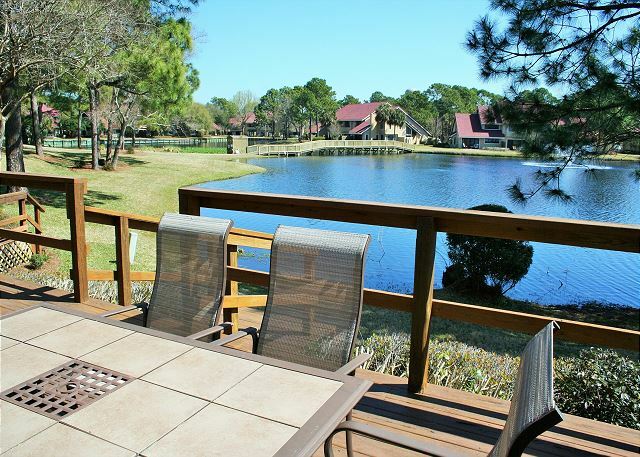 Sit Back and Relax on the Patio overlooking Horseshoe Lake. It is catch & release. So bring some fishing poles and enjoy your day. Master Bedroom is secluded from the rest of the home on the second floor long with the loft. Upstairs Master Bedroom features a King Size bed and overlooks the lake. Newly Remodeled Master bath with Huge Walk in Closet. Bedroom on the First Floor of the condo featuring a queen bed and it's own bath. Queen Bedroom also steps out to patio area that overlooks Horseshoe Lake. Bath off the Queen Bedroom in on the first floor of the condo. Includes a shower/tub combo. Twin bathroom that is attached to the twin downstairs bedroom. A two row golf cart is included for your transportation pleasure! 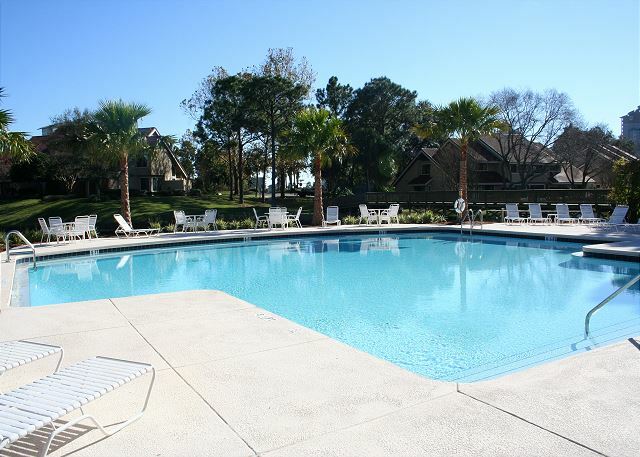 Beachwalk Pool is within walking distance of the Condo. Our home has three bedrooms and three full baths plus a queen sleeper in the loft and includes a two row golf cart. The home will sleep 8. You will appreciate the openness of the downstairs as enter the home. The kitchen has been newly remodeled with granite countertops and is fully equipped with extras that you need for an easy snack or a full dinner. The dining area seats six and barstools make room for two more. The great room features a flat screen TV with DVD Player and a great view of Horseshoe Lake. Have fun fishing in this 'catch and release' lake, which is only steps from the patio. Enjoy breakfast, lunch or dinner on the large deck overlooking the water. The downstairs you will find two bedrooms and two bathrooms along with a full size washer & dryer. Both of the downstairs bedrooms have 32” flat screen TV’s. The upstairs has a loft area with game table, flat screen TV and queen sleeper sofa. The Master Bedroom has a King size bed, balcony, flat screen TV and expansive bathroom. This end unit townhouse is a 10 minute walk to the beach and just a few minute walk to the pool. The pool is heated during prime visit seasons such as Thanksgiving, Christmas, & Spring Break. Whether you are here to enjoy the beach, pool, shopping, golf, etc. ; you are sure to feel relaxed as you enjoy your surroundings at our villa. DESTIN MEMORIES is an independent company that is not affiliated with, sponsored by or associated with any entity containing the word “SANDESTIN™.” any use or reference to the word “SANDESTIN™” is used in the factual sense to geographically identify a property or location and not to suggest any affiliation with any Sandestin™ branded entity, product or service. We had a wonderful Christmas time living in this house. Beautiful scene, Very clean, very comfortable. Kids had a lot of fun. Thank you! Christmas is a beautiful time at Sandestin. So glad that you were able to enjoy your family and the condo. The staff was very friendly and accommodating. I will definitely rent through Destin Memories again. 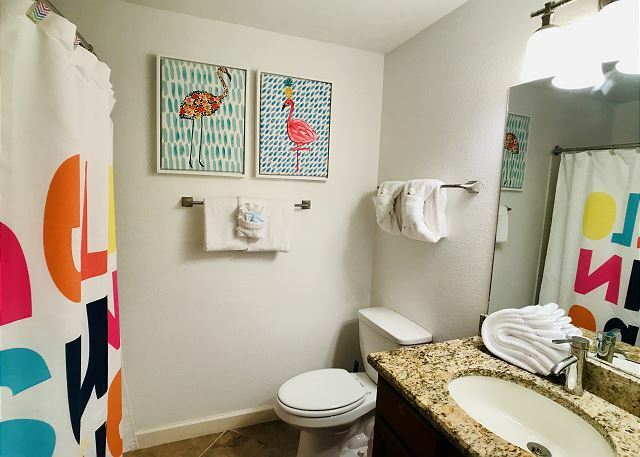 The pictures were a true description of the spacious condo. Thank you for your recommendation! We hope to see you again! This was my first time at this rental, the staff was friendly, professional and the Villa was amazing. 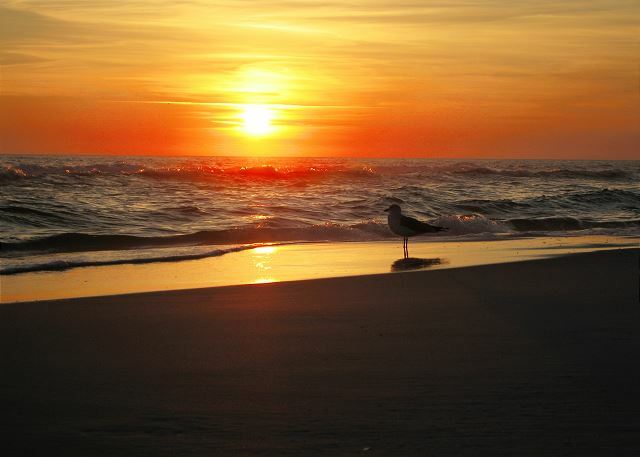 I am looking forward to my next Destin vacation and will be returning, to this location. I loved everything about it. Fantastic! Thank you so much. We love repeat guests and hope that you will check our website out to book directly. We LOVED everything about our stay. We have stayed in Sandestin for several years now, this is the first year we have stayed at a condo with a golf cart, which was like the icing on a cake. The condo was clean, and everything promised that we read and saw on the website. My husband and I wanted to get away from the harsh TN winter. When we rented this place, we were beyond excited to get away and enjoy a comfortable winter. We when first arrived and walked in what we now call “our new home away from home,” our expectations were more then we expected. This property is so clean, well decorated and very comfortable. We have had all the needs of a home. We have enjoyed the neighborhood and the convenience and safety of its location. We have enjoyed being able to relax, shop and dine. I think who has enjoyed our stay the most is our little shipoo, Lucy. It was a pleasure to have you & your family including Lucy come and stay with us! We hope that you will come back and call it home again. We spent, with our family of 5 children and 3 adults, the New Years weekend at 5188 Beachwalk Drive. Other than inclement weather, the accommodations, amenities were perfect for our family. The children even caught a 3# bass in the backyard lake/pond. With close proximity to the beach...10 minute golf cart ride and to The Village, this 3b/3b was ideal! We will be back! Communication with Destin Memories was efficient, also. This has been the best rental experience. Tricia was a jewel to work with and was available to answer any questions or concerns I had. She even found a restaurant that was open on Christmas Day. The carpet was new and the unit was recently painted. How lucky is that??? She had her personal golf cart to us to use while we were there. We used it every day going on a 3-minute ride to the beach. Restaurants were all a must go to on the next trip to Destin. Always love staying in San Destin, our favorite place, the condo was great and we can't wait to get back. Everything was great and the one call we made was answered immediately and resolved! Definitely stay again! It was a pleasure to work with you and your family. We hope to see you again in the future. We were in Destin for my son's beach wedding and wanted a house to accomodate the family. This house was very spacious and everything was in good shape. The grounds were beautiful and well maintained and the kids loved the pool and the small lake running through the property. Area was quiet and somewhat secluded yet just minutes away from all the attractions. It was a perfect choice for us! It was a pleasure to host you and your family for that special time in your life! I am glad that you enjoyed everything about your time here! We enjoyed our stay! The pictures do not show how big the townhouse actually is. My family felt comfortable in the home. The golf cart was a major plus! Hope to stay again next year. So glad to hear you had a great stay and the Golf Cart was an added bonus! The vaulted ceilings add to the homes overall feeling. It is actually 1850 square plus the outside deck! I hope to have you and your family again next year! My and my family's vacation rental experience was just what we wanted (privacy, cleanliness, easily accessible, additional transportation, access to numerous family activities and visible security). Sounds like you had a PERFECT vacation! We hope to see you again in the future! I loved this place and hope to come and stay longer next time! Thank you so much! It was a pleasure to host you & your family. We hope to see you again next summer! Loved the condo. Everything was perfect. With one exception...the queen bed is not comfortable. I believe it is time to retire it and get a new one. The guests who stayed in that room could only take a 2 nights in it. Fortunately for them the third couple had to cancel their plans, so they slept in the twin beds. Thanks for the heads up on the bed. You are the first to mention it. Beds can be very specific to individuals/guests. So glad that everything else during your stay was perfect! Great place to stay. Very clean and complete with all needed amenities. Loved the open back deck for relaxing each day. Short ride to the beach. Thank you so much! We hope to have you come back again in the future. My family enjoyed this Villa. There was plenty of room, nicely decorated and clean! The location was great also. Destin Memories Staff is great to work with. I would definitely recommend renting from them to anyone and would also use them again! It was a pleasure working with you! We hope to have you stay with us again real soon. Great rental property! I can't wait to come and stay again! It felt like home in this rental! It was clean, spacious, had everything we needed. Happy Anniversary & Many More! So wonderful to hear you had a great stay! We look forward to hosting you again in the near future. This is a wonderful condo to stay in. We were down in Destin for a wedding. 8 adults stayed here and it was a little tight since the couches are more comfortable than the loft mattress. But we had a great time. Super clean when we arrived and it has a great kitchen. Also awesome location in the resort. Close to the beach, pool, and shops. Really loved staying here. Would consider staying here again next time! Thank you so much for your feedback. WE are glad you enjoyed your stay at this wonderful property. Please let me know how we can help you in the future! Our family vacation was great. We really wish we could have stayed longer. The house was very roomy and beautiful. It was a pleasure to host you & your family! Vacations are so important - I am so glad that you were able to make the most of it! This unit was amazing! Extremely roomy and very clean. Having a golf cart to get to the beach and around town was an added plus! We had one of the most relaxing vacations ever! We had a wonderful time. The accommodations were clean and well maintained. We did have one night without power, but we bought candles and continued to enjoy! Would definitely rent again. You guys were great! It was a pleasure to meet you. I am sorry that Sandestin power was down for the night. I hope to see you again next year! Couldn't have asked for an easier experience or nicer place to stay! If the owners ever want to sell.. Please let me know! We had a great week in Sandestin. Having access to the transportation was a great plus. The walk to the beach was easy and helped keep a few extra vacation lbs off!! The condo is very comfortable and having 3 bathrooms was great. The lake view was also terrific. Looking forward to another visit next year. Thank you so much for the positive review. We hope that you will come visit again in the future! The property was nice and convenient to the pool & not too far from the beach. 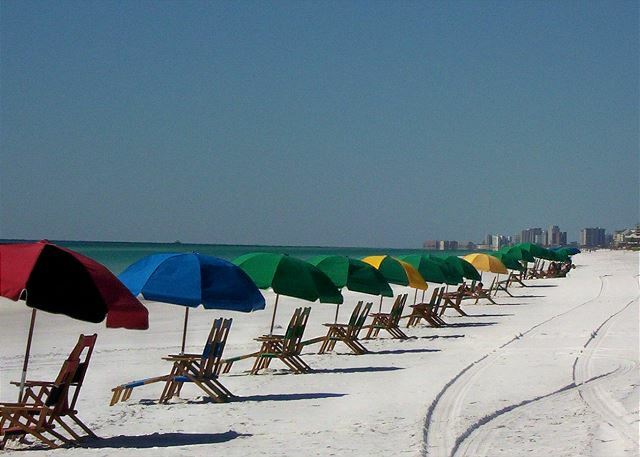 The week of May 8th was definitely a great time to be at Sandestin before the summer crowds got there. We met the owner, & she was very nice. It was a pleasure to host you and your family! I hope that you will return in the Fall for another getaway. We enjoyed the rental unit very much. Although it was easy to see that it was used, it was what we had anticipated for a rental. We would certainly stay in that unit again. Our experience with Destin Memories was excellent. Tricia was great and all of the arrangements went smoothly.